Kormak is a relatively young band hailing from Bari, Italy. The first sign of life dates back to 2015, born from singer Zaira de Candia’s idea to form a band. After a rather turbulent first period line-up-wise, the band found stability in 2017, working its way from there to a record deal to release their debut release. The band’s name comes from the fantasy book series The Kormak Saga by William King, which all members very much appreciate. Knowing this it can hardly be surprising the band’s core business is folk metal, be it with, as seems to be the standard these days, multiple influences form various other genres, of which death metal is the most distinct. 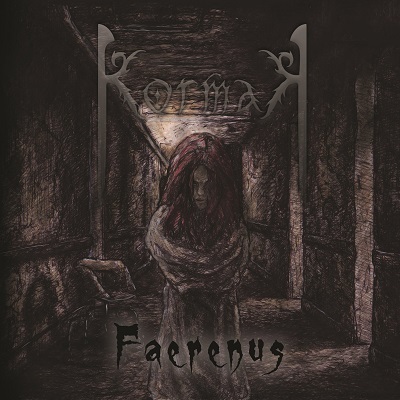 Their first release is titled Faerenus and its lyrical concept is aimed at madness and its causes. Faerenus is the ethereal place where all hidden fears come to life engulfing its visitors in nightmares. The band’s current line-up is filled with Zaira de Candia for vocals and flutes, Alessandro Dionisio and Alessio Intini on guitar, Francesco Loconte on bass and Dario Stella on drums. The story behind the world of Faerenus suggests the unsuspecting listener might very well encounter some of his or her worst fears in musical form. Opening intro Amon, which is basically an acoustic music-accompanied whispered text, actually contributes to this suggestion, but the next song, March of Demise is nothing more, but also nothing less, than a strong, heavily folk-influenced metal song with some nice acoustic pieces. Not that it has no musical references to nightmares, there’s, for example, various vocal lines that combine operatic tones with hoarse grunts, which apparently also are at least partly Zaira’s work, creating a somewhat unnerving, mildly aggressive atmosphere. A variation that is difficult to master to say the least, but definitely one I dig and in this case the execution is quite well. It might take a little getting used to though, mostly due to the eventually untrue idea the vocal lines seem a bit out of sync with the song’s rhythm. So to cut to the chase, it’s a promising start in my opinion. Next up is Sacra Nox, holy night in English, that kicks off with sweet, merry flute tones but quickly culminates into a full-blown heavy metal song. Here too the operatic vocal lines dominate the song, immediately ringing faint but distinct Epica-bells in my head. With the next song, The Goddess’ Song, Kormak initially changes course to much less heavy, but halfway through things get fired up again. Zaira goes along with the flow of changing course by utilizing a sweet clean vocal that builds up to a raw, more aggressive, clean vocal style full of emotion. It’s a style that fits her remarkably well, but the downside is that it mercilessly reveals a common flaw among Italian vocalists: the accent. Zaira suffers from that as well, but in all honesty it didn’t really bother me here, simply because the song itself and her particularly expressive singing in it are more than good enough to stop me from actually getting distracted by it. But then things seem to take a turn for the weird with the 22-minute-song (!) Hermit. The first few minutes it seems to be an acoustic ballad, but then the music ends and a prolonged silence takes its place only broken every few minutes by what seem to be random soundscapes. There is no way they actually are random, though. There’s a heartbeat, airplanes, an explosion, the link with an ongoing bombardment is easily made of course. The minutes of silence between the various soundscapes build tension, leaving the listener with growing anticipation of what might be coming next until the song ends with the same soothing melody it started with. If ever someone caught a nightmare caught in a song, this is it. Quite an experience to be honest. It’s up to the title song to fire things back up and re-focus the attention to the music, with which it has no problem whatsoever. It, again, starts with the sweet tones of the flute to lead you into a false state of peace of mind only to blow that away in an instant when the guitars kick in. The transformation is complete when Zaira unleashes a truly mean growl to fully engulf you in the next nightmare. The haunting whispers are a great detail to seriously add to the oppressive atmosphere. If you hadn’t noticed the developing song pattern with the relatively soothing start-by-flute intro building up to the operatically backed grunt ‘n’ riff, the next song, from a known-fears point of few expectedly entitled Patient No X, definitely will point you in the right direction. Build on the same base the majority of the songs is, this too is a solid nightmare-in-a-song. July 5 has the doubtful honor of being the penultimate song, slamming into power metal gear after starting the way we have become familiar with throughout this release and (spoiler alert!) ending with a little surprise. The album ends with, of course, a lullaby. It’s called Eterea El and has all the elements you need in a haunting lullaby. A slow, piano-backed, bordering on out of tune melody, whispered singing, crying, a girl laughing and lyrics that will keep you from closing your eyes to go to sleep, all produced as if it’s played on an old record player. Sweet dreams! Now, I can easily point out a few things that are of great influence on Kormak’s successful musical impersonation of nightmares, but the truth is that simply doesn’t cover it. There’s more to it than just that. It’s the fusion between all elements that creates an unnerving vibe that cannot be pinpointed and that is exactly what makes this release something special. Or different, depending on how you look at it and what your preferences are. However, if you ask me, and you did, I’d definitely go for ‘special’. I seriously had a great time listening to this release which also grew on me with every next spin. Great songs, ingeniously put together and greatly executed, what more can you wish for? This one will for sure turn up high in my year list. Forget folk metal, power metal, death metal or black metal, talented Kormak plays nightmare metal! Mandatory buy!